Admittedly, these are good times for Spitfire modellers: new plastic kits of the various marks of the Spitfire arrive every year. Every release carries new hopes of getting that ultimate rendition of the Spitfire’s shape which proved so difficult for many kit manufacturers to master. 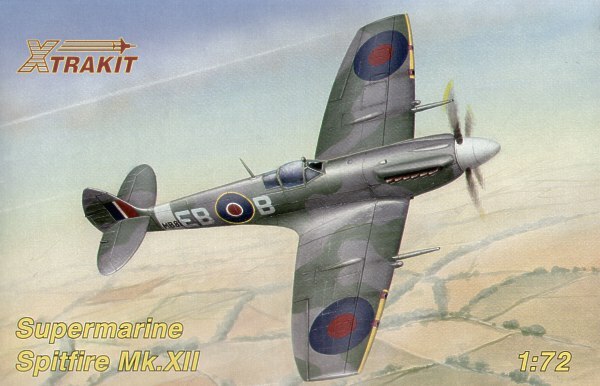 Hannants, UK’s largest hobby kit retailer and the maker of Xtracolor/Xtracrylics paints and Xtradecal decals, has just issued its first complete 1/72 Spitfire kit under the label of Xtrakit. It’s the Spitfire Mk. XII, the first Griffon variant of this fighter, to my knowledge not previously kitted in injection-moulded plastic. Kit no. XK72006, the Spitfire is only the second kit available in the Xtrakit range, but similarly to the previously released Meteor, it has in fact been produced in Czech republic by MPM. This time, however, the kit is not being issued simultaneously under the MPM label. No in-box reviews of this kit seems to have surfaced yet. Xtrakit Spitfire Mk. XII retails for around £8.50.